A Ballymena woman has pleaded guilty to the charge of failing to ensure the welfare of a Boxer type dog. Nichola McAvoy (42) formerly a resident of Dunclug Park in Ballymena, was sentenced after pleading guilty at Ballymena Magistrates Court, today, Wednesday 30 March 2016. It is understood the animal had to euthanised following veterinary advice. The charge was brought against Ms McAvoy by Mid and East Antrim Borough Council under the Welfare of Animals Act (NI) 2011. The charge for failing to ensure the welfare of a Boxer type dog related to findings following an investigation by Council’s Animal Welfare Officers in March 2014, concerning a dog in Ms McAvoy’s care. Ms McAvoy was given a conditional discharge for a period of one year and ordered to pay £169.60 costs to council. 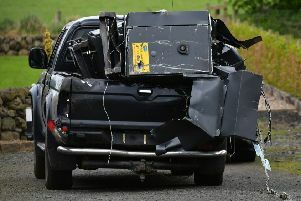 Having received the court report and accompanying pictures from Mid & East Antrim Council , the Ballymena Times asked if any plea in mitigation had been made on behalf of the defendant. We were told that no such plea had been made. However, on Monday, McAtamney Solicitors representing Ms McAvoy released a statement which raised a number of issues about the council’s press release. It stated: We wish to issue the following statement on behalf of our client. 1. On 7th March 2014 she was the keeper of a dog, to wit a boxer type dog that was caused to suffer unnecessarily. 2. On 7th March 2014 she, being the keeper of dog, to wit a boxer dog did fail to take such steps as are reasonable to ensure the needs of the animal were met to the extent required by good practice, to include the need to be protected from pain, suffering ,injury and disease. The matter was listed for contest on the above date as there was a lack of consistency in the veterinary opinions sought by the council on the dog and the dog was elderly with an underlying health condition. On the 4th February 2014 the council brought the dog to a veterinary practice where the vet declared the dog as “healthy but thin” but noted testicular issues with the dog but stated that should there be dis improvement in this area or nothing done then he would recommend euthanasia in the near future. The dog was returned by the council to Miss McAvoy. On 6th March 2014 another vet saw the dog and described him as “old, thin and healthy” but expressed concern about the testicular problem. On 7th March 2014 the first vet again saw the dog and recommended euthanasia for the dog whom he described as “an older boxer male dog”. It was ten years old. Subsequently the council did make contact with our client and it should be pointed out that she did in fact answer a pace interview letter sent out to her in which she answered all questions posed to her by the council. At court on 30th March the district judge stated he was not satisfied count one, which was the more serious charge, had been made out, described the council evidence on that charge as fragile and dismissed it. On count two a plea was entered on behalf of Miss McAvoy and a plea in mitigation was offered. Her counsel informed the court that the defendant was a single mother, this was her partner’s dog, he had moved out and left the dog behind. She was working 16 hours per week, had young children and couldn’t afford the veterinary bills. The dog was quite old but it was accepted she should have sought treatment. The Council sought a banning order against Miss McAvoy on keeping animals but the district judge ruled he was not satisfied the case was of such a standard and refused to make one. Miss McAvoy wants to make clear through ourselves that Barney was looked after her by her and other family members and was loved by them. The dog was regularly offered food and had been to the vets three times in the preceding twelve months. She accepts she did not bring him often enough to the vets, in light of his underlying health problems but she did not fully appreciate the extent of them at the time. She would add that Barney was the family pet for over ten years and it was only towards the end of his life that any issues of concern about his treatment were raised for the first time by the council. By that stage he had underlying health problems but our clients children did not want the dog put to sleep and he did not seem in pain. She believed he was just getting old and she would never harm any animal or pet, especially one that was a much loved part of the family for ten years.